Mix some butter into 1/4 cup of couscous together with that little bit of dried coriander left in the spice container, a dash of cayenne pepper and black pepper, and a couple of teaspoonsful of grated parmesan cheese [expiry date unknown]. Toss in about 10 baby carrots and 10 halved cherry tomatoes, one fistful of thawed frozen corn [also expiry date unknown but has been in the freezer for a while] and a couple of pinches of your daughter’s organic raisins. Open the fridge, deliberate over the pesto vinaigrette, then notice that your packaged ham and salami is due to expire the very next day and proceed to shred all the ham and salami into the salad. Crumble generous amounts of Blue Cheese, then Greek Feta Cheese over the top and lick your fingers [oh how I adore blue cheese!!]. Toss then return it into the fridge. The next day close to lunchtime, microwave container on High for 3 minutes. JT (my secretary): [Cornflakes] has a girlfriend!! JT: They got together yesterday morning!! 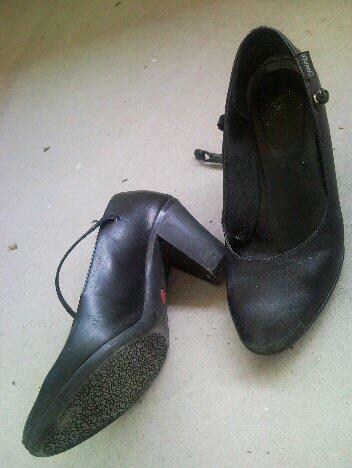 Me: [to Cornflakes, my paralegal] Erm…how did you get together with her yesterday morning when you were at work? Cornflakes: [rather sheepishly] By sms. Me: You asked her to be your girlfriend by sms?! How unromantic is that?! Cornflakes: I didn’t ask her. She asked me! NA (another paralegal): Cornflakes, you gotta show us that sms man. It’d make a difference whether I get a boyfriend or not!! I went home and found out that my fridge wasn’t shut properly and was leaking cold air all day, as a result of which, all my spinach has died. 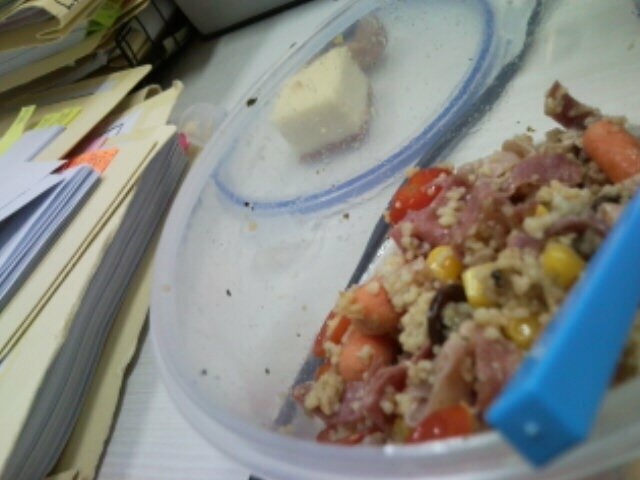 …is dreaming of Egypt while eating couscous salad with corn, spinach and raisins at her desk. I hope your spinach dies so that we can have lunch together!! Times like these, saving money, preserving sanity and maintaining friendships seem mutually exclusive. Exchange between myself and a vegetarian colleague when I bumped into him at the photocopying machine on my way back from the pantry to microwave my soup. Me: Hi! Are you lunching or can I offer you some of my salad? He: Salad?! Why would I want to eat a salad? I will lunch out later. It’s bad enough being a vegetarian. Having salad for lunch will make it even sadder!! He looks at her and he knows she doesn’t understand, he doesn’t think she’ll even remember it to understand when she is older. But he tells her these things all the same, it is good to say them aloud, they are things people do not think and he wants to place them into the air. Angels, he says, and she leans forwards as if she is expecting him to pass on a secret. I do not know about angels he says, perhaps there are many, perhaps they are here now he says, and she looks around and stands closer to him and he smiles. But there are people too he says, everywhere there are people and I think it is easier to hold hands with people than it is with angels, yes? He stops to get his breath back, he knows he is confusing her and maybe boring her, he knows that really he is saying these things to himself. He says I’m sorry I am talking too much, he says come and give your daddy a hug, and she presses into him and he clamps his arms around her. Now go and play again he says, the rain has gone, go and find your friend and keep looking for angels he says. She stands away from him, she turns away, she turns back and kisses him on the mouth and she runs away down the street.